I am thinking about signing up for Bicing again. Forgive and forget, that’s my motto. Two years ago, I dropped my membership in a moment of frustration. In my absence, it seems that Bicing has vastly improved and I may be ready to get back on Barcelona’s most popular bicycle. Bicing (pronounced Bee-sing) bicycles are firetruck red and chalk white, resembling a child’s bike on steroids. The squat cycles were designed not for looks, but to hold up under heavy use. Barcelona’s bikesharing program and is much like Mexico City’s EcoBike, Paris’ Velib, Miami’s DecoBike, or Montreal’s Bixi bikes. To date, there are 6,000 Bicing bikes available for riders in Barcelona, divided between 419 bike stations strategically placed throughout the city. Barcelona’s 6,000 bicycles are used by a base 124,477 members... which means at times, it is hard to find a bike. Let me give you a bit of the basics, in case you haven’t used bikesharing before. At many programs around the world, bikes are available at stations and users can check them out with a credit card or their membership card. In some cities, such as Spain’s Zaragoza, bikes are also available to tourists for a small fee. Signing up is easy to do, and most register online with a debit or credit card. A week later after registering with Bicing in Barcelona, new users receive their card in the mail. With this ID card users can check out a bike and then have thirty minutes of free ride time, paying .30 cents every half hour afterwards. 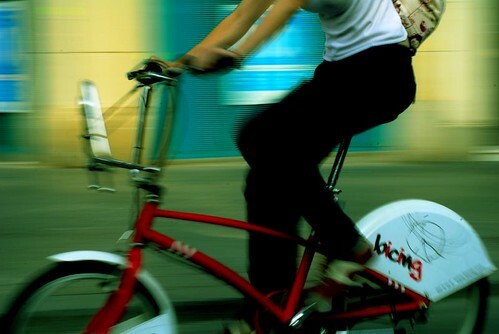 Bicing is another form of public transportation, like the bus, the subway, or the train. You get on at point A and get off at point B, and this should take no more than a half hour in a city the size of Barcelona. Charging after thirty minutes encourages folks to return bikes, and keeps them in circulation. This way, people are less likely to bogart a bike for the afternoon, which is important when there are only 6,000 cycles. If a bike is not returned, the rider responsible will have to pay for the missing Bicing in full (hence the credit card). When Bicing was inaugurated, people signed up for memberships by the thousands. There were many more users than bicycles in 2007, and often times I would arrive at a station and there would be no bike available, or the one that was would have a flat or broken handlebars. Bikes were the targets of vandalism and robbery. If it wasn’t the whole bike that was stolen, it was the bell, the seat, the pedals, or the lights. This high demand meets low-quality combo was made worse by frequent glitches in the computerized bike checkout system, as well as a lack of bike culture in the city. 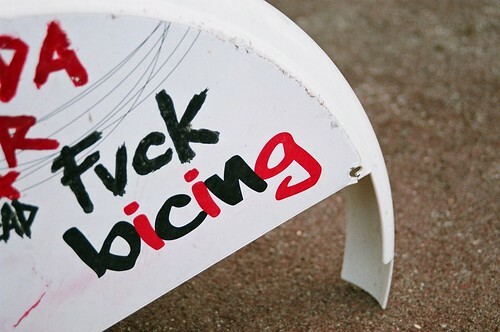 Users were not the only ones complaining about Bicing. Groups such as No A L’Area Verda want more car parking for Barcelona residents. “It is evident that when they add a Bicing station they take away parking,” sums up José Gutiérrez about the many Bicing stations placed in the street. Many drivers also object to adding bike lanes for the same reason. While the Bicing bikes have been improved (new seats, new bells, new pedals, new tires, new handle grips, new lights, and new Bicing stations that are almost 100 percent robbery-proof), creating a bike culture in the city has been a more difficult task. As of now, there are more than a 140 kilometers of bike lanes that weave throughout Barcelona. It is easy to do the math: 140 kms, plus up to 40,000 riders a day (combining Bicing and private bike riders), equals not enough. It seems that little by little that change is coming along. In the last three years, drivers have become more accustomed to seeing cyclists on the road, and overall, there is less honking and insults directed towards those on bikes. Cyclists, too, are learning to respect the rules of the road. When Bicing first became available, it was a bit of a free-for-all. Many new Bicing riders hadn’t a clue what the laws concerning riding a bike on the city streets were. It was not uncommon to see bikes in the bus lane, bikes zipping through crowded sidewalks, and cyclists failing to stop and lights or crosswalks. BACC (Bicicleta Club de Catalunya) helps people learn to ride bikes as well as the rules of the road. Every weekend, the organization holds a Bici Escola event, where adults spend two hours learning to ride. Lidia Moraño helps organize the Bici Escola, “The average age of students is 45 and most of the students are women,” Moraño explains. “Men have had more opportunities to learn to ride bicycles than women. Because of social structure and because of women’s role in society, they didn’t have time for it.” BACC also offers alternatives to Bicing with bike share programs for college students (Bici Campus) and civil servants (En Bici Al Trabajo). When I tell him of my plans to give Bicing another chance, Jordi Cabañas Faura smiles. “I am sure your experience will be a better one this time,” he says. As the saying goes, if you fall off your bike, get right back on and try again.